Okonkwo is a strong, angry man, famous and important in his tribe in Nigeria. He has three wives, many children, and a successful farm, mostly due to his relentless determination to keep everyone in his family (including himself) working harder than anyone else in the village. Okonkwo despises weakness, cowardice, and compromise. Sometimes his temper gets him in trouble with various gods and goddesses that the tribe worship, and he must pay the price for that. Okonkwo’s part of Nigeria becomes the focus of British colonialism at a time when Okonkwo and his family are banished from their village for seven years due to a crime of accidental murder. Missionaries and a new government run by white men come into the area and start to take over. Here, quite appropriately, things fall apart. I struggled with this book, particularly in Part 1, which takes up slightly more than half of the book. The entire focus is on Okonkwo, who is not a likable man, and the various rituals that that exist in his village. Okonkwo was horrible, beating his wives and children, shooting at them when angry, never forgiving any sign of weakness in anyone. He is angry, mean, and bullying. All during Part 1 of this book, I had this awful conflict inside. In some ways, I wanted to help those who were helpless in the village: the women and children. I didn’t want them to be treated so badly. I wanted them to be protected. On the other hand, I absolutely despise when cultures or countries come in to force their way of life on other cultures/countries. I imagine, though, that this is the conflict I was supposed to feel, given what came in Part 2 and Part 3, when the white men and Christian missionaries came in to “help” and “civilize” the native people. This is where the book got interesting to me – to see the conflict between British law and tribal law, as well as the clash of religions. I must admit, straight out, that I hate missionary work. Not all missionary work. I don’t mind missions that go to help people who need help. In other words, I don’t mind missions that aren’t focused on religion. But missions that focus primarily on converting people to one faith or another? Hate them with a passion, and always have. Especially when they work by force, trickery, or unethical persuasion. In my eyes, it’s wrong to force one’s religion on another person, and that’s exactly what the missionaries did in Things Fall Apart. The missionaries didn’t come in and say, “Here’s another way of life you might want to try.” They came in and said, “Your gods are false gods, only the Christian god is the true god.” They made it black and white: My god = good. Your god = bad. They treated those who didn’t convert like a lower class of people, ignorant of truth. It infuriated me. The law portion was not much better. The tribe had their own form of justice that did not tally with British law. Neither were better than the other. Both had good points and bad points, but the British law won. It was stronger and had better weapons. It conquered. Was it right for the British to come in and “civilize” these people? No matter how strongly I felt against Okonkwo and those like him, I would have to so no, absolutely not. To me, this is interference and the destruction of a culture. All cultures have their good and bad points. This tribe’s culture is different than ours, but that doesn’t mean it’s inferior. In many ways, we are all the same. This is illustrated most particularly in a conversation between Mr. Brown, the first missionary leader, and Akunna, a leader in the village. They talk about their two differing religions and how similar they are if you take them apart into elements. I liked that. It shows that we are all more alike than we think. After finishing the book, I understood better why the first half was so centered on Okonkwo and the tribal religions. Perhaps I’m wrong, but I think Achebe wanted to portray a man who was awful in order to make people dislike him. To make people think of him as uncivilized. Achebe could have chosen a different character, one who was kinder and less angry, but he didn’t. He showed a man who would beat his wives, bully his children, and force his family to work all the time. He showed a man who was constantly angry and lashing out. At the same time, Achebe took care to discuss all the aspects of their religion that are different from the Christianity that existed in most of the Western world at that time. He told about things we would consider horrible, like how they deposited twins in the Evil Forest and left them to die, or how they mutilated babies after a mother goes through a long cycle of birthing babies who die in their infancy. I think he wanted Western readers to think of this tribe’s culture as barbaric as possible, both culturally and religiously, so that when he introduced the “civilizing” white men, there would be a larger contrast and conflict within us. The white men are not civil. They murder whole tribes when they feel threatened. They show no respect for tribal customs or religion. They blackmail citizens. They starve and beat criminals in jail. The white men and their religion are no better than the black men and their religion. Both can be equally good. Both can be equally nasty. And if they are both equal, then what right does one have to take over and destroy the other? 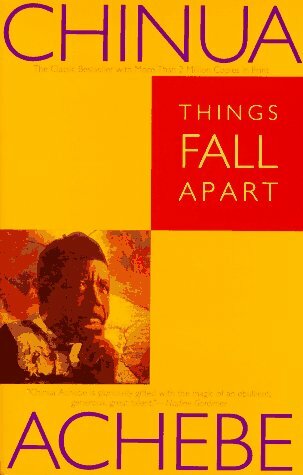 For me, that’s what Things Fall Apart was truly about. Writing. Family. Books. Crochet. Fitness. Fashion. Fun. Not necessarily in that order. Note: agender (she/her). This entry was posted in 2010, Adult, Prose and tagged Africa, classics, memorable, POC. Bookmark the permalink.